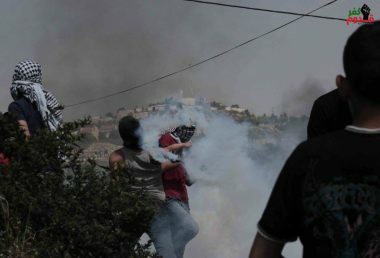 Israeli soldiers attacked, Friday, the weekly protest in Kufur Qaddoum town, east of the northern West Bank governorate of Qalqilia, shot and injured three Palestinians, including a teenager and a photojournalist, while many suffered the effects of teargas inhalation. The Popular Committee in Kufur Qaddoum said the soldiers assaulted the weekly procession in the town, and fired many rubber-coated steel bullets, gas bombs and concussion grenades, while Local youngsters hurled stones and empty bottles on the invading army vehicles. It stated that the soldiers shout Nidal Eshteyya, a Palestinian photojournalist working for a Chinese news agency, with a gas bomb in his back. The committee also said that a child, identified as Sobhi Obeid, 16, was shot with a gas bomb in the head, while a young man with a rubber-coated steel bullet in his leg, and six youngsters suffered the severe effects of teargas inhalation. Morad Eshteiwy, the media coordinator of the Popular Committee in Kufur Qaddoum, said the protesters marched carrying flags and signs in solidarity with the hunger striking detainees in Israeli prisons. Kufur Qaddoum holds weekly protests against the Annexation Wall, also demanding the army to reopen the town’s main road that was closed 14 years ago, to enable faster and easier access to colonialist settlers, driving to and from Kedumim illegal colony, built on private Palestinian lands.